Legend has it that the now-trending racket game pickleball was named after a dog. Or at least, that’s the story circulating around Bainbridge Island, Wash. about the sport’s founder, Joel Pritchard, and his dog “Pickles,” who reportedly once ran off with the ball during a game. Local lore is that Pritchard claimed the story sounded good so they left it at that. Not until recently did his daughter dispel the rumors, telling people that the dog was named after the game and not the other way around. Pickleball was in fact named by Joel’s mother Joan, a competitive rower, who referenced a “pickle boat” as being the slowest boat on the island. But the dog story sounded better so they went with it. No matter how it was named, the sport of pickleball is indeed making waves in the Western Suburbs of Chicago and beyond. Most recently, Butterfield Country Club in Oak Brook added the sport to its already growing racket program, and members and guest alike are finding it downright awesome. 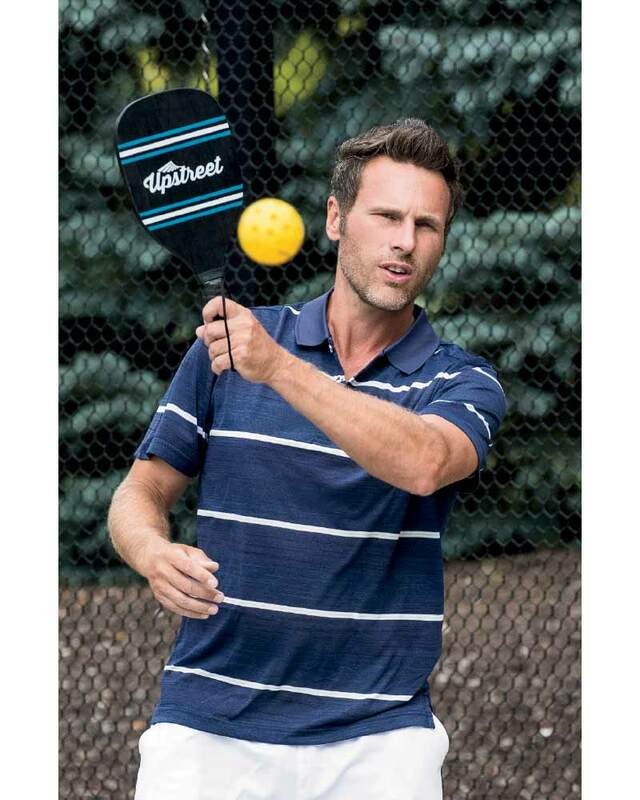 Pickleball is a sport that can be played year ’round, by people of all skill levels. It’s a fast-paced game, an amalgam of ping-pong, tennis, and badminton. There’s not much to it in terms of equipment as all you need is a paddle, a ball, and a net. The ball is a wiffle type ball, with smaller holes for outdoor use so as not to catch a lot of wind. Indoor balls have larger holes to move the ball around the court. The game is played either singles or doubles, but the rules resemble table tennis and badminton more so than traditional tennis. It’s played on a badminton-sized court, which is also why it’s becoming more and more popular in school physical education classes. “It’s an inexpensive way to use the badminton lines in schools,” Barello explains. The game is relatively easy to play and doesn’t require much skill. It begins with one side serving the pickleball. One foot must be kept behind the back line and the server must strike the ball with an underhand swing, aiming diagonally over the net, and clearing the no-volley zone which is referred to as “the sink.” In a doubles match, both players serve once, and then the serve is switched to the opposing team. Both sides must allow the pickleball to bounce first before hitting it with the paddle at least one time. After that, players may volley the ball if they are not within “the sink” boundaries. Much like volleyball, the team only scores points when they serve. A game typically played to 11 points and a team must win by 2 points. 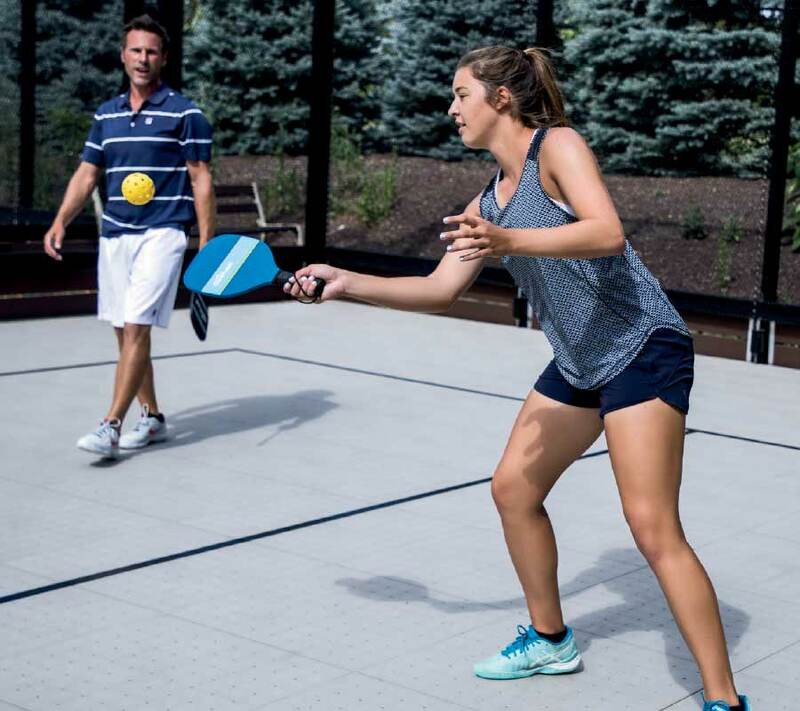 With tennis in the summer, paddle in the winter, and now pickleball throughout the year, members have unlimited racket sport options to get together with friends, stay in shape, and have fun.